Members of the “Greatest Generation” are aging quickly. 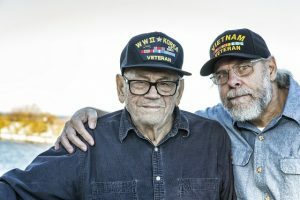 Home care may be beneficial in helping these older veterans continue the quality of life they deserve. Members of the “Greatest Generation” who are dealing with the challenges of advancing age may benefit from a variety of home care services. There are just under 2 million World War II veterans remaining in the U.S., and they are aging quickly. Many members of the “Greatest Generation” who are dealing with the challenges of advancing age need care and assistance with activities of daily living. Home care can be an ideal solution to help older veterans receive exceptional care and maintain the quality of life they deserve. Home care services assist veterans in a variety of ways. These offerings can include: professional companion care, such as conversation and company, as well as household duties like cooking, cleaning and laundry; and non-medical personal care, like help with individual needs such as bathing and hygiene, continence and toileting care, mobility support and assistance with eating. Home care also can assist veterans of any age living with injuries sustained in the field, as well as active-duty families that need help when loved ones are deployed. Respite care can be offered to family caregivers so that they may take time off from the responsibility of caring for their loved one. Wartime service veterans and their surviving spouses are eligible for VA pensions. One little-known existing benefit is the Veterans Aid & Attendance Pension, which helps reduce the cost of care for older veterans and surviving spouses. Aid & Attendance is available to eligible veterans and spouses who require home care – including assistance with eating, bathing and medication reminders – even if the assistance is not a direct result of a service-related injury. If you are caring for a veteran of the United States Armed Forces, make sure that your loved one is receiving the care and benefits they deserve. FirstLight provides non-medical home care under the Aid & Attendance program, as well as companion and personal care services to anyone 18 years of age and older who may need assistance. Are you caring for a family member of the “Greatest Generation?” What are some of the challenges you face providing care for your veteran loved one? Comment here or head over to our Facebook page to join the conversation. And don’t forget that November 11 is Veteran’s Day. Please take the time to salute and thank a veteran for their services to the United States.